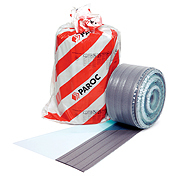 PAROC XSS 015 capillary break is a wide air and moisture sealant used as a capillary brake between a ground slab and timber constructions. It consists of cellular rubber strips applied to polyethylene film. The product has a laminated PE foil that is 400 mm wide on one side. This makes it easy to connect to the vapour barrier in the floor or on the wall.